This is a very healthy and delicious snack prepared with oats and nuts. These oats balls are great for kids and adults. It can be given to kids as an after school snacks or can be packed in their snack box. You can also take these when travelling. They are delicious and easy to make!! 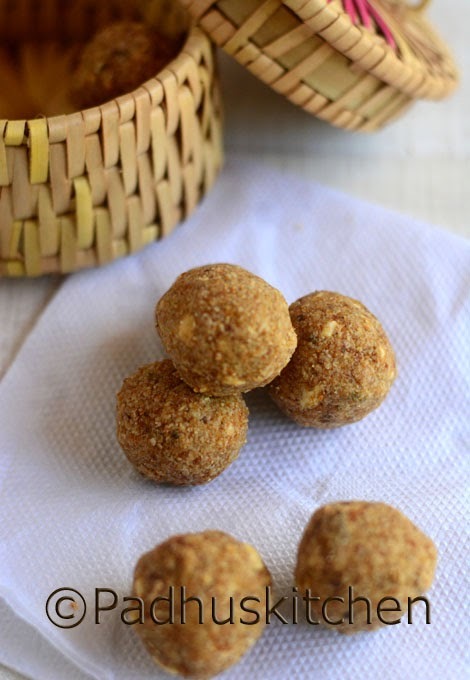 Today let us learn how to make Oats Nuts Laddu following this easy recipe. Dry roast oats until it is hot to touch. Cool and powder it. Powder jaggery and keep it ready. You will get good quality organic jaggery powder in health stores. Dry roast cashew nuts and almonds separately. Chop it finely or powder it coarsely. In a bowl, mix together, oats, jaggery, cardamom powder and nuts. Heat a tsp of ghee, saute the raisins until they puff up and add to the oats mixture. Melt needed ghee and add to the mixture little at a time. Mix well and make balls. Make sure that the ghee is warm. Storage and Shelf Life - Store it in an airtight container. Stays good for 15 days at room temperature. Variations - I experimented this oats laddu by adding extra virgin cold pressed coconut oil instead of ghee, it was very delicious but should be used within 3-4 days. Yes, this laddu can be done with unrefined cane sugar also. Yes, it should be ground. I want to add dates. Should I first dry roast the dates pieces then add this to the oats mixture? No, you do not have to dry roast dates. Chop it finely and grind with the oats mixture. If you are adding dates, reduce the amount of jaggery and ghee. If we add the dates, shelf life will reduce, correct? It will stay good for how many days? No, even if you add dates, it will stay good for a month. Avoid using wet hands. I made them in like 10 minutes and within minutes they were gone! Yes, you can but roast it well. Can maple syrup be used instead of jaggery? Added some dates and reduced the quantity of jaggery. As awesome as ever.